Way back in 1925 a book was written called The Painted Veil, which told a story of love, heartbreak, and betrayal in the midst of a cholera epidemic in rural China. I’m not sure what the initial reaction was to the novel, but it spawned a plethora of adaptations dating back to 1934 and starring Greta Garbo. Another adaptation happened in 1957 with the film The Seventh Sin, an overlooked movie that cost MGM a great deal of money. The version I’m going to be talking about is the 2006 film starring Naomi Watts and Edward Norton. 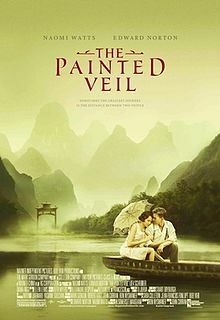 The Painted Veil is one of those movies where I’m really glad to have watched it, but it’s not something that’s going to stick with me for very long. Kitty (Naomi Watts) is a well known and admired socialite who has no real interest in doing much of anything with her life, despite the pleas of her parents to find someone to marry and build a family with. Kitty is taken off guard one night when she meets a bacteriologist named Walter (Edward Norton) who asks her to marry him the next time they meet. She agrees to the marriage for the sole purpose of getting as far away as possible from her family. The couple move to Shanghai for Walter to continue his work, but Kitty meets Charlie (Liev Schreiber), a British government official, and they begin an affair. Walter quickly learns this and volunteers for a position to study Cholera in a rural village suffering from an epidemic. He brings Kitty along as a punishment and threatens to create a scandal if she doesn’t accompany him. It is in the middle of the sickness and the death that Kitty and Walter are forced to face mortality and their own selves to discover what is really important in their lives. The first thing that pops out at me in The Painted Veil, and where I think the film is most successful, is in its production design. This is a gorgeous looking movie that’s beautifully shot and filled with excellent costumes and set designs. Being a period piece, it’s very important that the film has a sense of time and place, and this one knows and understands its time very well. This is why I really love well made period pieces, because they have the ability to transport you to a time that you’ve never seen before or never had the chance to experience. This also comes in handy when dealing with the plot point of a cholera epidemic. It hits the viewer hard and director John Curran pulled no punches in showing the horror that these people went through before a real cure was found. You can clearly tell that the studio and makers of this film were really trying to push this movie as Oscar bait. Unfortunately, it never got to that point. I will say that they cast the right actors to get audiences’ attention, including mine. I think Edward Norton and Naomi Watts are two powerhouse actors, and usually give their all to whatever movie they’re in. The same can be said about their performances in The Painted Veil. They have really good chemistry together, which makes it all the more upsetting when the hostility between their characters reach their boiling points. There’s also real fear behind the stone wall façades that the two characters have built up, which make them feel all the more human. There’s also some great performances by the film’s minor roles with Toby Jones and Anthony Wong. It’s hard to pinpoint where this movie falters, but I can’t help shake the feeling that the full potential of this film wasn’t reached. It may be that this story and its archetypal characters have been seen a dozen times before since the original story was written way back in 1925. There’s lots of flash in the production design and the acting, but I knew exactly where the story was going to go before I even started watching the movie. I had a good idea of what was going to happen based on the plot summary and most things I predicted came true. That takes a lot of joy and fun out of watching a movie since it feels like I’ve seen it all before. There are certain plot points in movie that can be predictable and have the movie remain intact, but when I can guess the entire movie, beat by beat, it kind of makes me rethink how entertaining the movie actually was. I’m glad that I watched The Painted Veil because it has some really great production design, very good acting, and an interesting enough hook to get me engaged in the story. I feel as if I don’t need to see it again, however, because at the end of it all it was a very predictable film. It doesn’t dare to be different from any other romantic period drama, and it actually seems to try really hard to stay within the parameters of a very exact formula. If anyone ever asks me if they should watch The Painted Veil, I’d say sure, but I’d never go out of my way to recommend it. Let’s get back to the Bourne series. In the first review, I stated that The Bourne Identity has been one of my favorite action films since I can remember, and that The Bourne Supremacy is a flawed but worthy sequel. Now we have The Bourne Ultimatum and the most recent entry, The Bourne Legacy. This is going to be a very conflicting review because one of these movies is quite frankly one of the best action movies ever made, and the other is an unnecessary mess that made me feel like I wasn’t even watching a Bourne movie. I think you could guess which one I’m talking about. Nevertheless, let’s get this started. The series continued in 2007 with The Bourne Ultimatum. Picking up right where The Bourne Supremacy left off, Jason Bourne (Matt Damon) is trying to covertly make his way out of Moscow. Six weeks after his escape, the CIA begins tailing journalist Simon Ross (Paddy Considine) after he publishes articles about Bourne and is overheard on his phone talking about Operation Blackbriar. This forces Bourne to also track him to find who his source of all this information is. 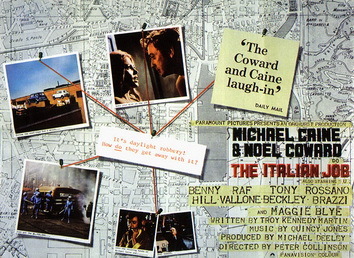 Now back in the crosshairs of the CIA, specifically Deputy Director Noah Vosen (David Straithairn) and the more sympathetic Pamela Landy (Joan Allen), Bourne fights his way across the globe trying to find answers about his past and Operation Treadstone, which ultimately leads him back to New York City where the truth will all finally be revealed. Way up high on the Mount Olympus of film, The Bourne Ultimatum acts as one of the main representatives of action. It’s everything you want in an action movie, but then also delivers an intelligent story and rich characters. I will say that the annoying Paul Greengrass shaky cam is still there, but the action is so wild that I could easily look past it. There are stunts that happen in this movie that goes to show you don’t need CGI for everything. One scene in particular shows a car going up a divider and spinning off of it into another car which causes both of them to roll out of control. Watching the special features on how they did that was absolutely incredible and makes this movie even more impressive. The Bourne Ultimatum is easily the best film in the entire series. It reveals a lot about Bourne’s past, introduces new villains while reinforcing heroes we’ve come to love. There’s plenty of action and espionage to keep the most jaded and critical film goer at bay while also telling a really dark and intelligent story that mirrors the real world in some scary ways. My only real complaint is how Greengrass uses the camera in action sequences, but it really wasn’t as annoying as it was in The Bourne Supremacy. The bottom line is that this is one of the best action films ever to be made and deserves all of the praise and accolades that it receives. After that masterpiece, there was a lot to live up to. What came next, however, was kind of weird. That was the 2012 film The Bourne Legacy. Taking place during and after the events of The Bourne Ultimatum, The Bourne Legacy introduces Aaron Cross (Jeremy Renner), a genetically enhanced super soldier who’s part of a CIA black op called Operation Outcome. The consequences of Bourne’s actions mixed with inner departmental problems forces Eric Byer (Edward Norton) to completely shut down Operation Outcome, and by that he means whipe out all of the agents working around the globe. They don’t count on Cross surviving the attack and how desperate he would be to get his hands on the pills that keep him genetically superior. He soon finds and enlists the help of Dr. Marta Shearing (Rachel Weisz), a biochemist who has analyzed and treated the agents of Operation Outcome. The two travel to the Philippines to inject Cross with a serum that will permanently keep him a step above the rest, but the CIA and local authorities seem to always be around every corner. As I was watching The Bourne Legacy, I was really trying hard to get into it. Edward Norton and Rachel Weisz both give good performances, and Jeremy Renner makes Aaron Cross a very memorable and fully realized character. There were even a few scenes that were really cool, like a long take that has Cross scaling a house, going into a window, and shooting someone. That’s where it all ends. This movie does not feel like an addition to the Bourne series. There’s only a few scenes with characters from the trilogy and brief mentioning of things that Bourne is doing. Cross doesn’t even really qualify as a “legacy” because he’s part of Operation Outcome and not Treadstone. I don’t understand this movie in the least. The Bourne Legacy is really missing out on a lot of key elements that make the other movies great. For one thing, the sense of completely grounded realism is gone for me with the introduction of these pills that make super soldiers. Another thing is that the action is less than stellar and even boring. Finally, there just isn’t enough of a connection to the other movies. It’s one thing that Jason Bourne isn’t even in this, but there was still a lot of room to make a spin off that really brings the movies together. Unfortunately we got this mess of a movie. Well there you have it. The first three Bourne movies are spectacular action movies that helped redefine what the genre should be while also telling a story full of intriguing characters and memorable twists. Just don’t let The Bourne Legacy sour what those movies accomplished. Every so often, a movie comes around that makes me really appreciate all the creative work that film makers put into it. When I first saw the trailer to Birdman, I was set and ready to see it. When I saw that Alejandro González Iñárritu was in the director’s chair and also wrote the film, I was more than ready to see it. This is a film like no other that I’ve seen in a very long time, with a story that hits you where you really feel it and cinematography that will make you rethink how the medium can be utilized. This is an amazing film, and very well may be the best movie of the year. Riggan Thomson (Michael Keaton) is an aging movie star best known for his portrayal of the comic book hero, Birdman, in the early ’90s. Now, he considers himself to be washed up and only remembered as the man behind the mask, so he decides to reinvigorate his career by adapting a Raymond Carver short story into a full length Broadway play. A number of things begin to go really wrong including replacing one of the actors with the belligerent, but well known, Mike Shiner (Edward Norton), getting into multiple confrontations with his recovering drug addict daughter Sam (Emma Stone), and just plain bad luck. At this rate, it would be a miracle if they made it through the few previews they have before opening night. Where do I even begin? When I left the theater, I was completely wound up and trying to sort through all of my thoughts on the movie. It was just so exciting to see a movie that seemed to hit everything perfectly. I don’t have a single complaint about Birdman. First off, the cast in this movie are excellent. Michael Keaton completely owns the show and I’d say deserves some recognition when the time comes for Best Actor nominations to be announced. The other person that matches Keaton’s level of performance is Edward Norton, who I think deserves his own bit of recognition when the time comes. Everyone else is also note perfect.Zach Galifinakis, Emma Stone, and Naomi Watts are all memorable in their own ways, which brings me to my next point. I was really surprised at the layers the characters had. 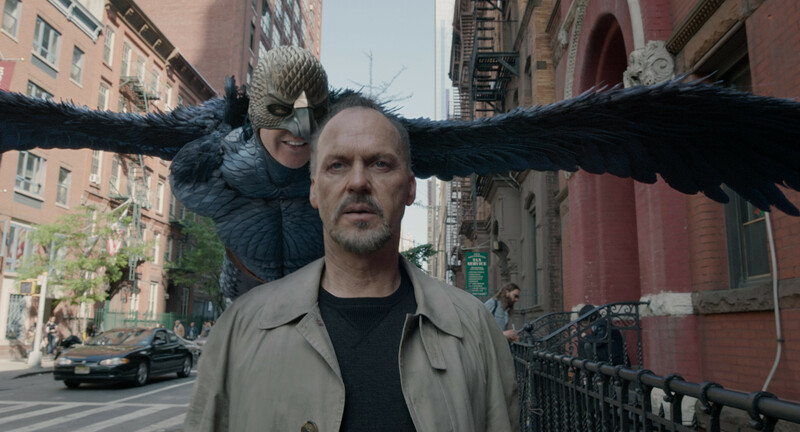 It’s great when characters are fleshed out, but the ones in Birdman were strangely real. There aren’t any good people or bad people, but only people who have troubles that affect how they live their day to day lives. Each day that passes presents each character with their own set of problems, and the most entertaining part of this movie is watching each person deal with the issue, but also change a little bit because of it. The arcs that start in the beginning and get wrapped up as the movie progresses come so naturally and I believed everything I was watching, even though there were moments of fantasy strewn throughout the film. This is one of those movies that I think is just perfectly written. Every joke made me at least chuckle and the drama was enough to completely floor my emotions. In my opinion though, the most impressive part of Birdman was the cinematography and the editing. The audience literally follows these characters around as they prepare for the show’s opening night. By that I mean that the camera doesn’t cut until a few minutes before the end of the movie. Now, I know that would be ridiculous to say, because it is ridiculous. It’s not like this movie is one continuous take, but it is cleverly edited to make it seem like it’s one take. Think of Alfred Hitchcock’s Rope, except the cuts are much more subtle. Does the film have to be edited like this in order to work? Certainly not. The movie would have been just fine if it was edited normally, but it did add a new dimension of appreciation and skill that wouldn’t have been there. 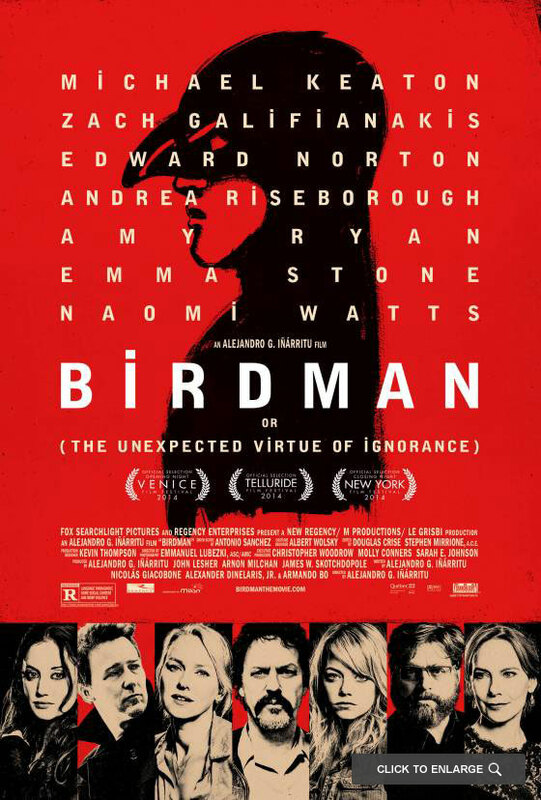 Birdman is a movie that is sure to blow you away, just like it did with me. I went in expecting a lot and left feeling like I was given a lot more than I could’ve ever wanted. This is a comedy with an sort of depressing edge to it, but one that seems very understood by everyone working on the film. The bottom line is that every part of this movie came together so perfectly that it surprised me. If you haven’t gone out to see Birdman yet, consider it your duty as a human being to get to the theater as soon as possible! Wes Anderson is one of those film makers that I trust will always make a good movie. His style inspires my own style of writing. 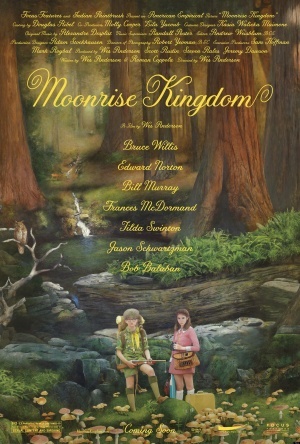 I didn’t get a chance to see Moonrise Kingdom in theaters, but I have to say that it was worth the wait. This is the best movie he has made since The Royal Tenenbaums, and one that will stay with you for a long time. In the summer of 1965, the small New England island of New Penzance is thrown through a loop when two young children in love Sam Shakusky (Jared Gilman) and Suzy Bishop (Kara Hayward), run away together. Now it’s up to the eccentric townsfolk to find them before the worst storm to ever hit New Penzance hits. Sam and Suzy give them a run for their money showing the adults that love, no matter how young, is still strong. This is kind of a bad summary because this isn’t a very easy move to explain in just a few sentences. There’s the main plot with the two children running away, but the story of everyone on the island is just as interesting. Each and every character has their own sets of personal problems that make them eccentric and unforgettable. For a Wes Anderson movie, I had very little trouble connecting with these characters and feeling the dysfunction. Part of me being able to connect with the characters has a lot to do with the performances. Bill Murray and Frances McDormand have the exact brand of awkward chemistry that is needed for a couple growing further and further apart. Bruce Willis and Edward Norton are the scene stealers as the two authority figures who just don’t have the ability to keep everything under control. Finally, in a small but worthwhile role, Jason Schwartzman rounds up the laughs as a Khaki Scout who knows exactly how the system works. It’s a motley of characters that mesh very well. Even Jared Gilman and Kara Hayward do a fine job, if not a bit too deadpan. And of course, there’s no way I can talk about any Wes Anderson movie and not talk about the impeccable composition of the shots. Every shot is so symmetrical. Even if a character is placed at the left side of the screen, the use of empty space is experimented with so well that nothing seems uneven. Along with the composition are the colors and costume design. This all fits into the idiosyncratic style of Wes Anderson that makes all of his movies special. 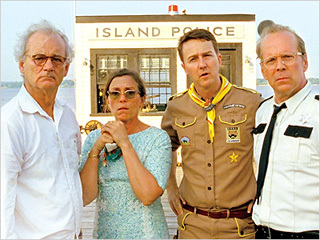 I’m not quite sure if I can call Moonrise Kingdom Wes Anderson’s best movie, but it definitely ranks in the top tier. It’s a surprisingly hopeful movie amongst all the melancholy, which is a bit of a change for this director. It’s a great conglomeration of characters, stories, and messages that are both funny and tragic. 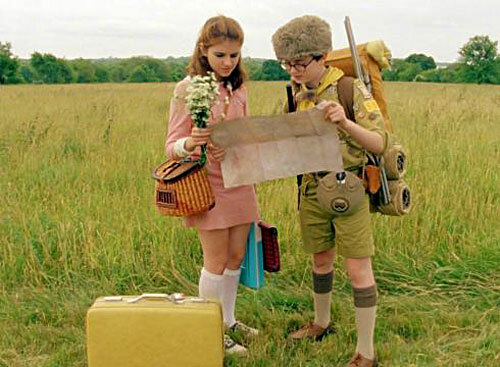 I don’t just like Moonrise Kingdom, I love Moonrise Kingdom. Personally, I refuse to acknowledge that the 2003 Ang Lee film Hulk exists. It simply does not. If it did, it would be the perfect example of how NOT to do a movie about the Hulk. It was dry, slow, and uninteresting. Thank goodness that in 2008, the year of the comic book adaptations, Marvel released the reboot that the Hulk deserved, this film being The Incredible Hulk. The Incredible Hulk wastes no time getting started. In the opening credits, it is revealed that scientist Bruce Banner (Edward Norton) was conducting an experiment to make humans immune to gamma radiation, but he was testing this on himself. Something in the experiment goes wrong and he is infected with a tremendous amount of gamma rays, transforming him into the Hulk. General Thaddeus Ross (William Hurt) begins a hunt to find Banner, claiming that his body is property of the United States Military. A team of Marines is assembled led by Royal Marine Emil Blonsky to find Banner, but Blonsky soon becomes envious of the power Banner has and is determined to harness that power himself, which soon turns him into the Abomination. When The Incredible Hulk ended, I said to myself, “That is how a film about the Hulk should be made.” This film is a tremendous amount of fun and had me grinning ear to ear with the multiple intense action sequences and the subtle tongue-in-cheek inside jokes that fans of the comic book and television show will love. The special effects in this movie are also something that needs to be raved about. The Hulk looks fantastic and flows great. The same can be said about the Abomination. The entire showdown between the Hulk and the Abomination is a total CGI-fest, but it looks great and was so much fun to watch. It made me think what it actually looked like on the set as compared to what we are seeing as the final product. Edward Norton really put his all in making Bruce Banner believable and sympathetic. Personally, I think he did a fantastic job, and it’s even said that he wrote his own version of the screenplay, some of which was used in the film. Liv Tyler looks and acts great here too. Some of her lines border on the cheesy side of the spectrum, but I went along with it. William Hurt and Tim Roth made great villains who are really easy to hate. William Hurt especially. This film does a great job at making Bruce Banner out to be a regular person who does not want this weight on is shoulders, and likewise, Edward Norton conveys this perfectly. Sure, The Incredible Hulk is about seeing the Hulk cause as much damage as possible, but it’s also about the psychological and physical stress that it puts on Bruce and the supporting cast, both good and evil. There is also a small part of the film that seems to explore the morality of science. The Incredible Hulk is, to put it simply, incredible. I laughed, I was on the edge of my seat, and I couldn’t wait to see what happened next. The ending scene alone is fantastic. I can’t say it beats Iron Man, but that’s understandable. That would be very difficult. 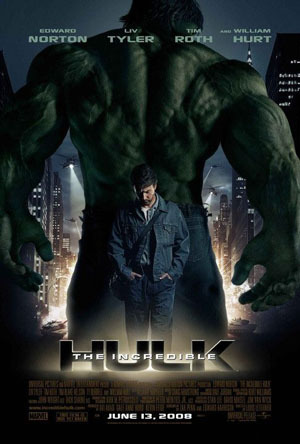 Still, I loved The Incredible Hulk and consider it a vast improvement to Ang Lee’s Hulk. One final note, to clear up any confusion: This is not a sequel to Ang Lee’s film. It is to be considered a reboot and a tie-in to The Avengers, where as Hulk is not (thank goodness).